Dear Santa Message Mugs by Burton & Burton. Red ceramic mugs with green dots and a green handle accented with a black bow with white dots. 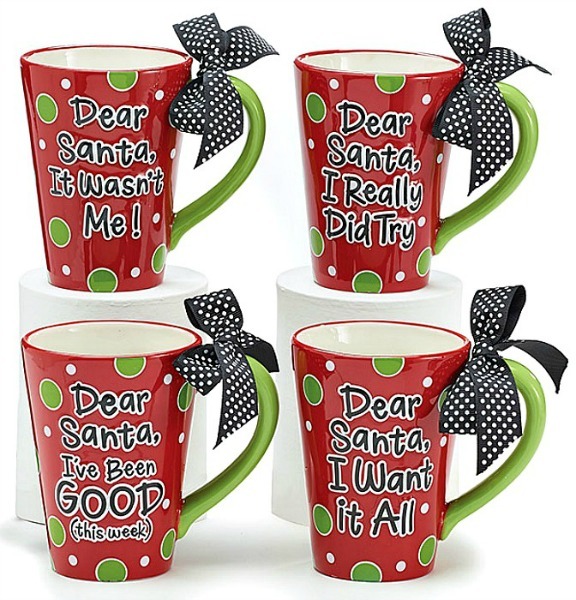 Each mug has a different "Dear Santa" messages. EACH SOLD SEPARATELY! Dishwasher safe/FDA approved/Microwave safe. Measures 4 1/2" H x 3" Opening. Holds 12 oz. Includes gift box.